In 1892 the United States celebrated the 400th anniversary of Christopher Columbus's first voyage and the following year staged the World's Columbian Exposition, held in Chicago from May to November 1893. The exposition attracted 27 million visitors to its more than 600 acres of grounds and exhibit halls. Most states and many foreign countries contributed exhibits, some large enough to fill entire buildings. In 1891, in preparation for the World's Columbian Exposition, the North Carolina General Assembly authorized a Board of World's Fair Managers of North Carolina, which selected exhibits showing the "natural and industrial products" as well as the history and culture of the state. Alexander B. Andrews and Thomas B. Keough represented North Carolina as state commissioners on the World's Columbian Commission, with Elias Carr and G. A. Bingham serving as alternates. The commission also appointed "lady managers" from each state; Florence Hill Kidder and Mary Roberts Price served as North Carolina's lady managers, with Sallie Southall Cotten and Virginia Stella Devine serving as alternates. 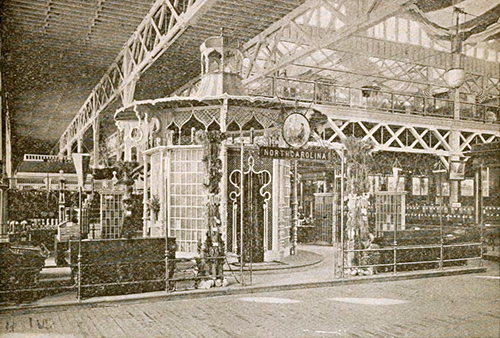 The North Carolina board decided not to construct a separate North Carolina building at the Chicago exposition, instead concentrating on exhibits in the halls dedicated to agriculture, forestry, mines and mining, fisheries, and horticulture. The agriculture exhibit displayed North Carolina products and a selection of soil samples showing "the strata from the surface to a depth of several feet." The forestry exhibit held samples of over 100 types of wood native to North Carolina, each four feet long and four inches wide and collected by Gifford Pinchot, forester of the Vanderbilt estate outside of Asheville. There was also a display of 500 different medicinal herbs and plants from the state. The North Carolina mines and mining exhibit held a vast mineral collection from the state, including over 180 varieties of gems; gold ore and nuggets; iron, silver, and copper ore; building stone; and a 300-pound mica crystal. The fisheries exhibit held mounted specimens of fish and waterfowl native to the state, fishing traps, nets, and other equipment. The horticulture exhibit, the smallest set up by North Carolina, held a selection of wines and some fresh and preserved fruits from the state. There were also North Carolina exhibits in the Woman's Building and in a space in the rotunda of the Government Building dedicated to the history of the 13 original states. The North Carolina exhibits won a total of 157 medals and awards-more than all the other southeastern states put together. After the exposition, the North Carolina display cases and exhibits were taken to Raleigh and placed in the State Museum (the forerunner of the North Carolina Museum of Natural Sciences). William Stephenson, "Sally Southall Cotten and the Chicago World's Fair of 1893," NCHR 58 (October 1981). "Report of the Board of Agriculture to the General Assembly for years 1893-'94: Appendix: World's Columbian Exposition: Official Report of Executive Committee." Public Documents of the State of North Carolina Session 1895. Raleigh [N.C.]: Josephus Daniels. 1895. http://digital.ncdcr.gov/u?/p249901coll22,119683 (accessed September 13, 2012). "An act to provide for the collection, arrangement and display of the products of the state of North Carolina at the World's Columbia Exposition of eighteen hundred and ninety-three, and to make an appropriation therefor." Laws and resolutions of the State of North Carolina, passed by the General Assembly at its session of 1891. Raleigh [N.C.]: Josephus Daniels.1891. p.641-643. http://digital.ncdcr.gov/u?/p249901coll22,434917 (accessed September 13, 2012). "Report of the Board of Agriculture to the General Assembly for years 1893-'94: Appendix: World's Columbian Exposition: Official Report of Executive Committee." Public Documents of the State of North Carolina Session 1895. Raleigh [N.C.]: Josephus Daniels. 1895. p. 39. http://digital.ncdcr.gov/u?/p249901coll22,119685 (accessed September 13, 2012).